Germany's chancellor, Angela Merkel, has revealed that she will be entering discussions with French President Francois Hollande with a view towards a Euro-centric communication network. The network would see data from Europe channelled away from US servers to prevent unauthorised access. Merkel has been a proponent of greater data protection in Europe recently following damning reports that mass surveillance had been carried out by the US National Security Agency in Germany. According to reports released by NSA whistleblower Edward Snowden, Merkel's own mobile phone was also hacked. Government surveillance is a sensitive topic in most German circles, in part down to the heavy-handed snooping carried out by East Germany and, earlier, under Hitler. Merkel, in a podcast, decried companies like Google and Facebook for basing their operations in countries with such low data protection. 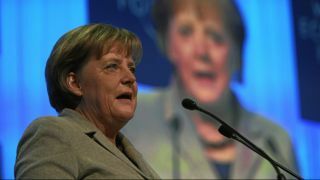 Merkel told journalists that the discussions would revolve around increasing security for European citizens by building a pan-European communications network, Reuters reports. It is understood that Paris agrees with Berlin's proposals and that both governments are in deep discussion over the matter.